With my youngest daughter turning two, I wanted to do something that wasn’t “commercial” for her party as I felt there would be lots of years ahead to have princess and fairy parties. 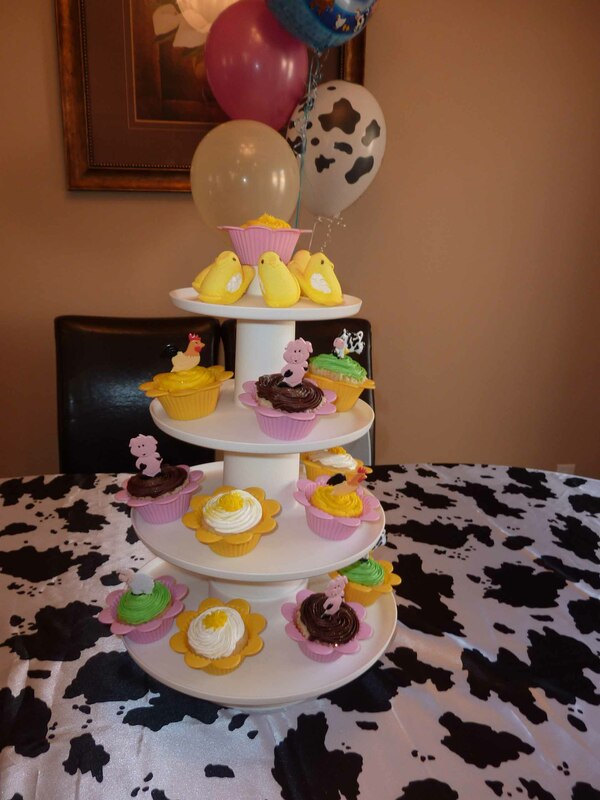 I had the “Old MacDonald’s Farm” theme in mind months before the actual day, which gave me lots of opportunity to purchase decorations and party favors when I saw them on sale. Costco had beautiful farm animal hand puppets in sets of four for eight dollars, which were the main part of the loot bags for the young friend, and Walmart had Lego farm sets on clearance from $13 down to $3, so the older kids all left with a new box of Lego as their take away. Needless to say, I was very happy with these party favours. I love decorating cupcake, and even more so I love to serve them. No cutting cake and having a line up waiting, everyone can just pick the cupcake that they like the look of and go from there. Here I had a mix of chocolate and vanilla cupcakes. Some were decorated like pigs in mud (the mud being chocolate icing), or sheep in grass (green tinted vanilla icing), some had disco dust (an edible, very sparkly and pretty glitter). They were very fun cupcakes. It was easy to decorate for this party. I put up yellow, pink and cow print balloons, and was pleased that my older daughter (age four at the time) know that yellow balloons represented chicks, pink for pigs and cow print for cows. I picked up cow fabric and had a friend sew the edges to make a table cloth, pink and yellow streamers, and I put out farm animal books and the Fisher Price Little People Farm out for the kids to have easily accessible theme related toys and books to play with.